last call for submissions: comfort food! Just a reminder that submissions for potluck 2: the comfort foodening are due on the 31st of May! I know, I know, I haven't even written anything yet. TOMORROW. NO SERIOUSLY. I'm going to be talking about pandan. I have lately been feeling very virtuous in the breakfast department. Lots of vegetables in my fuscrams; lots of avocado and tomato on toast (instead of plain jam); mushrooms on toasts; extra fruit in my cereal. And on one very excellent occasion, fruit cake cupcakes. The breakfast of which I have been feeling most pleased is the red quinoa porridge. It's really easy. The most arduous part is washing the quinoa, over which I always stress. The rest of it is pretty easy. Wash one cup of quinoa three or four times. 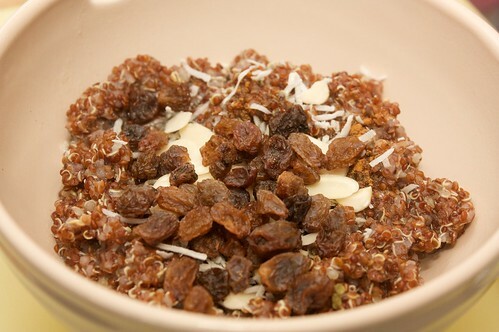 In a saucepan with one cup of water, one + a half cups of *milk, and a quarter of a cup of (chopped) dried fruit, bring to a boil, then reduce heat and simmer partially covered for about fifteen to twenty minutes, or until it's of a consistency that you like. You could also add a tablespoon of sugar (preferably brown) during this simmering process. You may want to add more liquid if that is your fancy, though don't expect it to ever hit an oat porridge consistency. Top with whatever you like. I like shredded coconut, dried fruit, chopped almonds and a little golden syrup. 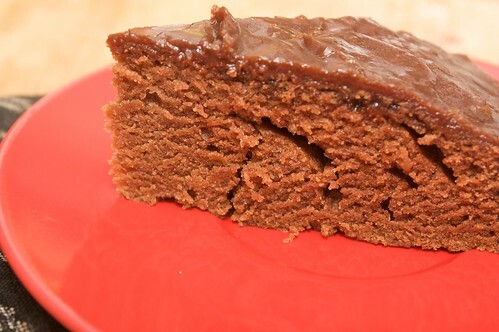 Following a discussion around the existence of vegan mudcake, I was provoked in to committing acts of the same, guided by this Mississippi mudcake recipe on vegweb, and goaded on by Certain Vegans. This cake was good. It had a lovely flavour, lovely consistency and texture and was easy to bake and held up well over a few days, but it was not mudcake. It was too light and fluffy and not filled with any molten chocolate at all! However it is a recipe I would repeat, and I have ideas for transforming it in to mudcake. I made no mods! Which is terribly unlike me. Last week I caught up with Miss T Princess Vegan for after work drinks and dinner. After a very stressful Wednesday where I wasn't sure I'd ever leave the office, we met up at Lane's End where I ended up with a delicious cocktail which contained strawberries, mint and lemon in it, and then we tipsily wandered across the road to Nudel Bar. Service on Wednesday was great. Super attentive and very vegan-ly helpful. 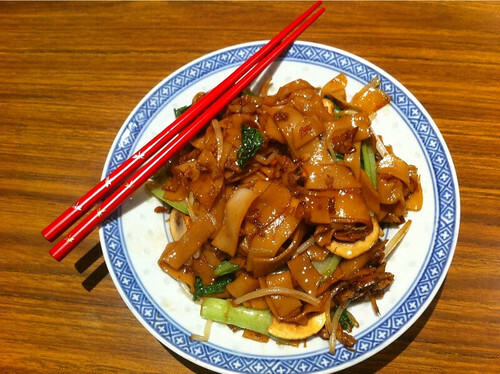 We shared the mee goreng (with rice noodles instead of egg) and the vegetable and noodle dish, which as always was deliciously heavy on the mushrooms and contained my second favourite type of noodle, the flat rice noodles that go in CKT. Oh yeah. We rounded out the meal with the sago pudding, which neither of us had before had. The pudding was chilled, and contained lotus and water chestnuts, served with a side of golden syrup. This was super delicious! I loved adding the sugary syrup, and it was fun to eat. We also drank two pots of the most delicious Jasmine tea I've ever had. When we inquired, as there were some lovely flavour notes in it, we were informed that it's fresh tea, rather than dried. That was pretty delightful. Submissions can cover anything you like, and you do not have to stick to the theme! but please remember that we are trying to talk about intersections. Potluck is, after all, intended to be a carnival for multicultural and intersectional discussions of food, including but not limited to food discussions intersecting with disability, gender, sexuality, fat, animal rights, and cultural and racial issues. More details at the original post! Please submit! TELL YOUR FRIENDS. Just a reminder that submissions for Potluck 2: Comfort Food are due in about a week! (The 15th) You do not have to be vegan to participate, posts from all types of eaters are totally cool, so long as you are talking about food and intersectionality! Guidelines are available at the original post! Please submit something! I should write something too, whoops. I went to a wedding at Scienceworks last week! Scienceworks is a pretty cool venue for a party, I had lots of fun taking photos and hanging out with the gauges and stuff. Although the wedding was not vegan, and it was just a cocktails kind of party, I found that I was amply catered for. There was a vegan version of most of the little courses, and the person with the vego/vegan platter would always try to find me first so I got something, and that was all very lovely. And then, there were the cupcakes. Ant's sister Cate, who is not actually a baker (though aspires to running a cupcakery + confectionary), made this amazing cupcake tower for the party. 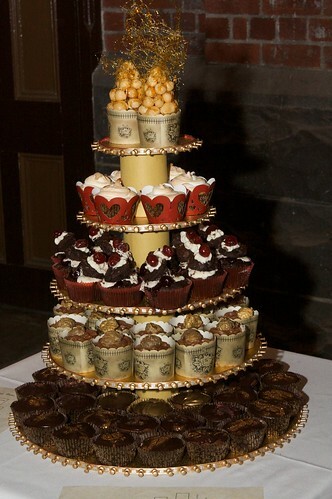 Here is what makes this cupcake tower so amazing, though. The level that I could eat was not, in fact, the bottom, plain chocolate (mudcake) cupcake layer. Oh no. 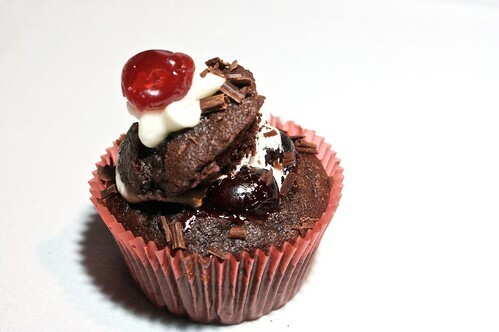 It was the blackforrest cupcake layer. Basically, this was so amazing that I can't wait until she has an actual cupcake shop so I can eat this all the time. And try making it. And so other vegans I know can employ her to bake for their parties. This was SO GOOD. Also, I love it so much when my non-vegan friends make sure that I am just as over-the-top catered for as everyone else. The other thing I do when I'm in Perth is eat things that people cook especially for me. 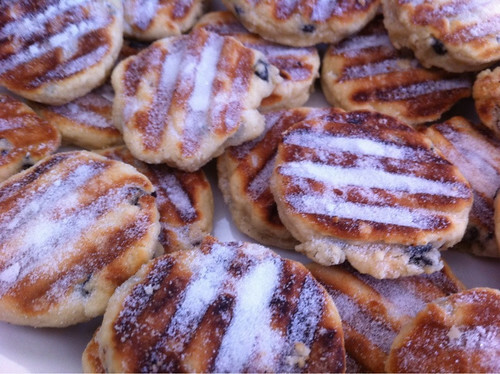 I don't know how to describe my levels of excitement when these Welsh cakes appeared in front of me! I went for afternoon tea with the Ex-Laws, and Nan went to experimental lengths to make me vegan Welsh cakes, and apparently they were just as they should be! Certainly I found them just as they should be (delicious), and had to fend off non-vegan interlopers who could have had their pick of the raspberry slice she'd brought, or the cupcakes already there, and instead tried to eat all my Welsh cakes. They were SUPER DELICIOUS, I will have more please! On my first night at my parents' house I was way too tired (after five days in the con hotel with (surprise!) 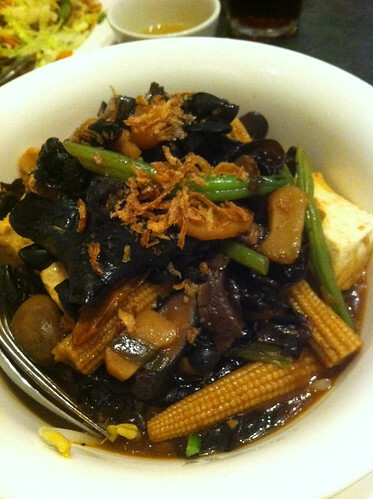 not a lot of sleep) to actually go out for dinner, so I requested my mother make CKT for dinner. Which she did! I love it when my mum makes CKT, she makes a portion for every person because everyone wants it slightly different. But this means sometimes she forgets things from batch to batch: in my case, chilli. On my last night staying with my parents, we decided to cook some curries and things. 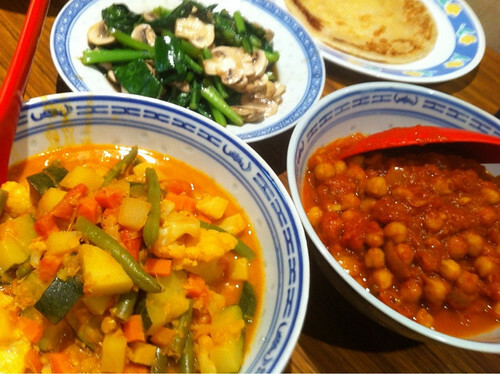 Featured here are a vegetable curry (cooked by mum); a chana masala (cooked by me); and some gailan and mushrooms. OH YEAH this is one of my favourite meal sets. Thanks, Perth! As always you were delicious. Tell me where you go for your favourite dosais! 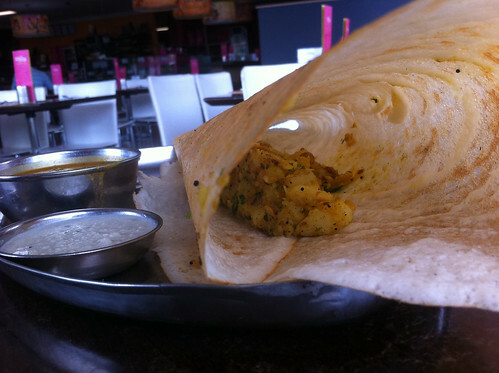 My favourite is at Mela Indian Sweets, in Northbridge. I always get the masala dosai, the potato in the masala starts to mush together and it's filled with fresh chillis, and caramalised onion, and cashews. Cashews! They are a delicious addition. The dosai at Mela is always served with a rasam and tiny little side dishes of coconut and tomato. $15 well spent every time! 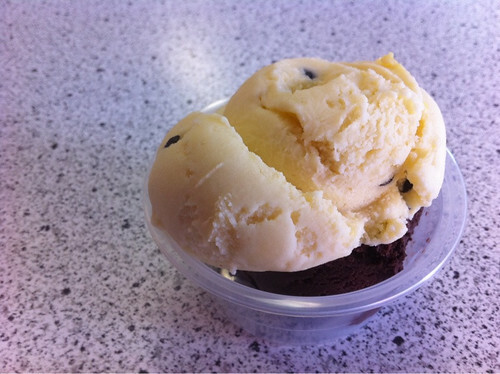 My favourite flavour combination at the Junction Icecreamery is always ALWAYS passionfruit and chocolate. There are a few other soya flavours but they are the best! Ended up at the Swan Valley Cafe again with my parents and my sister, this time for lunch. 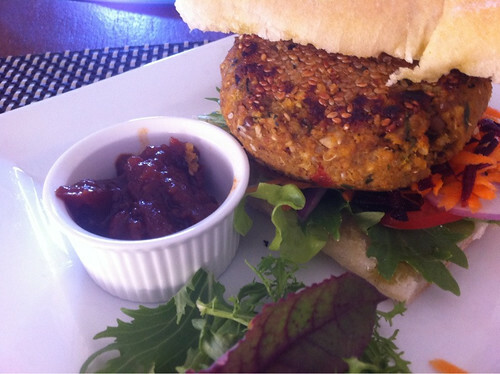 The lunch menu is not as exciting as the dinner menu (though there are some pizzas on the take away menu which I might try for next time), and I opted for the burger with a tomato chutney. This is a perfectly serviceably burger, but it does noticeably require the chutney, as it is not exploding with flavour. My sister had a tart (not vegan) with salad, and the quinoa salad was terrible, it clearly hadn't been washed enough times. Still happy to go back, especially as it's the closest vegetarian restaurant to my parents' house, but it was a little disappointing. In Perth recently, Emilly and I ventured up to Fresh Provs to provision our hotel room with deliciousness for the con+Easter weekend. 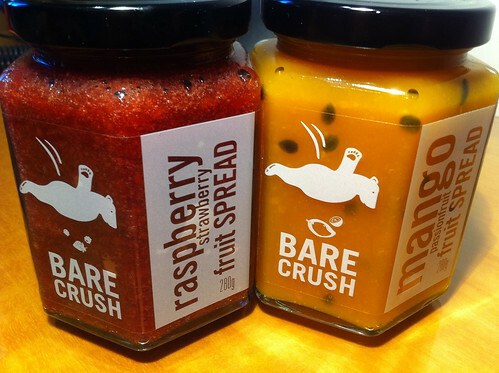 Within Fresh Provs' delightful shelves we found this deliciousness: Bare Crush fruit spreads. I went for the mango and passionfruit, she picked the raspberry strawberry. These spreads were totally delicious. They're not exactly jams; they're not rendered down as much as jams, and they start to spoil very quickly so they've clearly not been preserved in the way of jams. Spreading the raspberry strawberry across my bread the first morning (no toasters in five star hotels! ), I found an entire strawberry in front of me! The flavours were delicious and not too sugary for an early morning start, and I think of the two I preferred the strawberry raspberry. These are pretty expensive, but I would buy them again if I were in Perth long enough to finish a pot.